I haven't seen this one in person yet but I love the pictures of the Miniskull rug. 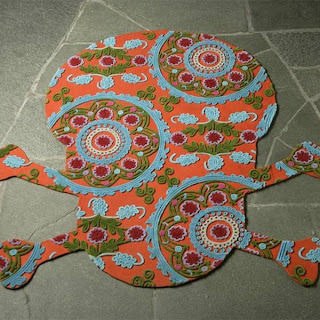 It blends cheerful colors and designs with a laid-back fabric and a fairly traditional skull and crossbones shape in a way that works shockingly well. Oddly enough the black version doesn't quite go together in my opinion, even though I tend to think of black as a more skull-like color than orange. These are custom made in limited editions of 50, but there was no price listed.